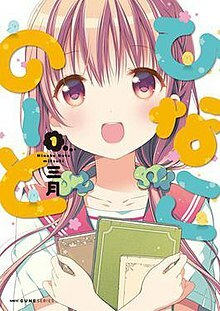 Hinako Note (ひなこのーと, Hinako Nōto) is a Japanese four-panel manga series by Mitsuki. It has been serialized since August 2014 in Media Factory's seinen manga magazine Comic Cune, which was originally a magazine supplement in the seinen manga magazine Monthly Comic Alive until August 2015. Five tankōbon volumes of the manga were released between August 27, 2015 and December 27, 2018. Hinako Note is also available on Kadokawa Corporation's ComicWalker website. An anime television series adaptation by Passione aired in Japan between April and June 2017. Having always had an interest in theater but struggling to talk with others, Hinako Sakuragi moves to Tokyo to attend Fujiyama High School, staying as a resident at the Hitotose bookstore. Upon learning that the school's theater club is actually on hiatus, Hinako and the other residents form their own theater troupe. A first year high school girl who moves to Tokyo in the hopes of joining a theater club. She is friendly with animals but struggles with talking to other people, often winding up in a scarecrow-like pose. A first year high school girl who works at the Hitotose bookstore. She has a heavy appetite and will occasionally eat pages from the store's books. A second year high school girl who works in Hitotose's coffee shop, often dressed in maid attire. Despite being older than Hinako and Kuina, she looks and often acts like an elementary school student. A second year high school girl who is a member of the currently-on-hiatus theater club and landlady of Hitotose Manor. Hinako's classmate who strongly loves Chiaki and often has a one-sided rivalry with Hinako. A nine-year-old child actress and the advisor of the theater club. Hinako Note is a four-panel manga series by Mitsuki, a Japanese manga artist who mainly draws adult comics. It began serialization in Comic Cune's October 2014 issue released on August 27, 2014; At first, Comic Cune was a "magazine within a magazine" placed in Monthly Comic Alive, later it became independent of Comic Alive and changed to a formal magazine on August 27, 2015. Hinako Note is also available on Kadokawa Corporation's ComicWalker website. Five tankōbon volumes of the manga were released between August 27, 2015 and December 27, 2018. An anime television series adaptation by Passione was announced. The series is directed by Toru Kitahata, with Takeo Takahashi credited as chief director. The anime aired in Japan between April 7, 2017 and June 23, 2017 and was simulcast by Crunchyroll. The series ran for 12 episodes. The opening and ending themes respectively are "A-E-I-U-E-O Ao!" (あ・え・い・う・え・お・あお!) and "Curtain Call!!!!!" (かーてんこーる!!!! !, Kāten Kōru!!!!! ), both performed by Gekidan Hitotose (M.A.O, Miyu Tomita, Yui Ogura, Hisako Tōjō, and Marika Kōno). "My Talent Is Being a Scarecrow"
Hinako Sakuragi, a girl who struggles with talking to others, moves into the Hitotose bookstore in Tokyo, meeting two of its residents; Kuina Natugawa, who has a habit of eating books, and Mayuki Hiiragi, who likes dressing as a maid. Having come to Tokyo in hope of joining her Fujimiya High School's theater club, Hinako is shocked to learn that the club has apparently been shut down. As Kuina and Mayuki take Hinako to the park to cheer her up, they come across the landlady, Chiaki Ogino, who explains how the theater club is on hiatus due to the advisor being away. Noticing Hinako's interest in theater, Chiaki suggests that they all start up a theater troupe together. Hinako recalls how she always used to serve as a makeshift scarecrow for the local farmers, struggling to properly thank them for the vegetables she received in return. Hearing how Hinako wants to theater to become better at speaking, Chiaki suggests that she start off the theater troupe as its principal in lieu of working in the shop. After naming their group the Hitotose Troupe, the girls set a goal to one day perform at the Suzuran theater. As Hinako struggles to talk with others on her first day of school, Chiaki's friends put together a theater society to replace the on-hiatus club, with Chiaki inviting Hinako and Kuina to join. This attracts the attention of their classmate, Yua Nakajima, who becomes envious of how close Hinako is to Chiaki and joins the society too. Wanting to prove her superiority, Yua keeps stepping in whenever Hinako is asked to do something, which Hinako interprets as an act of kindness. The next day, Hinako tries working in the coffee shop with Mayuki, during which she manages to help a lost girl get in touch with her mother. Encouraged by the experience, Hinako asks Yua to be her friend. Child actress Ruriko Kuroyanagi, who was the theater club's advisor before putting it on hiatus, returns from overseas training to help the society prepare for the upcoming culture festival. Meanwhile, Mayuki ends up gaining attention with her dancing while Hinako manages to express a talent for singing. Later, Mayuki explains that she doesn't care much for theater as it takes too much of Chiaki's attention away from her. The next day, Ruriko chooses Hinako as the heroine for her play, despite her still being nervous about performing. "A Kind Girl Who Isn't Kind"
Yua gets increasingly annoyed at Hinako due to her clumsiness in dance practise and her closeness to Chiaki. Afterwards, Hinako tries imitating some animals in order to broaden her range of expressions. Later, Yua spies on the girls in the park as they help Hinako with her practise, admiring her determination and helping out herself. "Maids, Ghosts, and the Stage of Dreams"
With one day left until the culture festival, Hinako is surprised to learn Chiaki won't be acting in the play, as she wanted to give the new members a chance to shine, but manages to give a successful rehearsal. On the day of the festival, Hinako ends up forgetting all of her lines as a result of trying to learn everyone else's, so Yua and Kuina give her some last minute practise. During the play, Yua ends up forgetting a prop handkerchief, but Hinako and Mayuki manage to help work in a replacement, leading the play to become a success. Afterwards, Ruriko and Yua offer to help Hinako with the Hitotose Theater Troupe. Upon making plans to go to the beach, the girls go to a department store to pick out swimsuits. While at the beach, Mayuki gets lost and comes across Ruriko, who tries to help her find her way back. As Hinako goes off to search for Mayuki, her animal magnetism helps Mayuki find her and join up with the others. Yua pays a visit to Hitotose to lend Hinako some acting DVDs, only to discover she doesn't have a DVD player. Later, Hinako catches a cold from overworking herself, so the others try to help cure it. "We'll Have a Training Camp"
While Hinako is worried about her mother coming to visit, the girls try to come up with a play to draw customers to the Hitotose during a stamp rally event. Upon hearing their plans, Ruriko arranges for the girls to have an overnight training camp at school to practise. During the night, Hinako and Yua sense a mysterious figure in the darkness, which they discover to be a stray cat. After Kuina finished her script for Troupe Hitotose's place, Mayuki has everyone try out costumes she has made. On the day of the performance, both Hinako and Ruriko's mothers come to watch, putting further pressure on Hinako. With support from her friends, however, the play manages to be a success. "From One Year to the Next"
The girls decide to put together a play of A Christmas Carol for Christmas Eve, which proves popular thanks to Hinako calling in a real deer. Later at the start of the new year, as Kuina and Mayuki go to visit their families, Hinako and Yua joins Chiaki in helping out at the shrine. "The Place We Longed to Reach"
Hinako becomes anxious after walking in on Mayuki cooking something mysterious for Chiaki late at night, which just turns out to be Valentine's chocolate. On Valentine's Day, Yua tries to work up the courage to give Chiaki her handmade chocolates. The next day, Chiaki invites everyone to a play being held near Suzuran, which they pay a visit to. ^ a b c d e f g "Hinako Note TV Anime Reveals Main Cast, April Premiere". Anime News Network. December 22, 2016. Retrieved December 22, 2016. ^ "4コマ誌コミックキューン、アライブ内に誕生" (in Japanese). Natalie.mu. August 27, 2014. Retrieved September 17, 2016. ^ "4コマ誌キューン創刊、なもりポスター付録＆「パンでPeace！」アニメ化" (in Japanese). Natalie.mu. August 27, 2015. Retrieved September 17, 2016. ^ 新4コマ誌コミックキューンの全連載作品が、ComicWalkerで無料配信 (in Japanese). Natalie.mu. October 28, 2015. Retrieved September 16, 2016. ^ ひなこのーと 5 (in Japanese). Kadokawa. Retrieved March 5, 2019. ^ "Hinako Note Manga About Girl With Poor Speech Gets TV Anime". Anime News Network. August 26, 2016. Retrieved August 26, 2016. ^ "Passione Animates Hinako Note Manga's TV Anime". Anime News Network. November 25, 2016. Retrieved November 25, 2016. ^ "あらすじ|TVアニメ「ひなこのーと」公式サイト" (in Japanese). Retrieved May 9, 2018. ^ "Hinako Note" (in Japanese). Tokyo MX. Retrieved April 7, 2017.